Each of these principles contributes to the overall success of your space. Today we will be focusing on emphasis, which is a central piece of art or furniture plays the role of a focal point or attention grabber. Other items around the focal point are used to complement it. A feature wall is a great way to emphasize an area in a room. 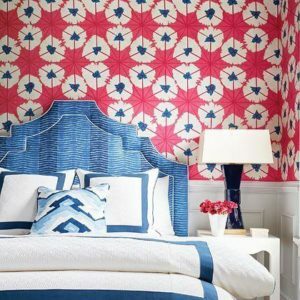 This can be done with a contrasting paint color, an attention-grabbing wallpaper, or an interesting piece of art. Color is a quick an inexpensive method for bringing emphasis to a space. 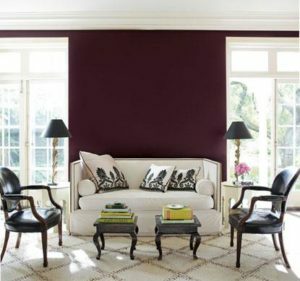 This deep purple wall works beautifully against the light and bright elements in the room. The interesting lines of the sofa are highlighted by the dark background. This color is a showstopper, while allowing the sofa to take center stage. Wallpaper draws the eye and adds emphasis where needed. The wallcovering below is both functional and aesthetically attractive. Magnolia Home by Joanna Gaines makes this interesting wallpaper that serves as a chalkboard wall in an office area. Note how the wallpaper and the fabrics complement one another. Our Thibaut line of fabrics and wallpapers are designed to coordinate with one another. If you are looking to add some emphasis to your space, come see us at Columbia Paint or Clarksville Paint and Decorating Design Centers for one on one assistance. We have over 250 wallcovering books and nearly as many fabric books. We also carry rugs, window coverings, and everything you need to paint your space. Stay tuned for next week’s design principle feature; We will be providing more tips and tricks to DIY your interior design.